While originally attending college to major in Biology, and then Philosophy, Lauren ultimately decided to leave school and work in the corporate world to help make up her mind as to what she wanted to do since she was clearly terrible at deciding without having more experience. During this time, she fell in love with technology and decided to go back to school for Software Engineering (while also working a laundry list of odd jobs, such as baker's assistant and pizza delivery driver). She became particularly interested in the requirements gathering process as a Business Analyst and then a Product Owner. She believes working with others to identify goals is one of the most exciting processes one can experience! 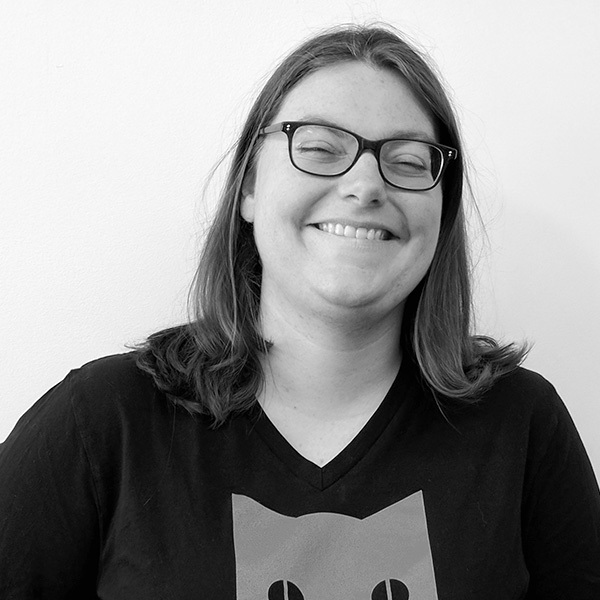 Outside of working, Lauren enjoys reading (especially about productivity and agile processes), going out to dinner with her wife, and going to the movies. Ready to learn more about our newest Mojo? Having worn many different hats over the years, both professionally and in various hustle-type jobs, I’ve gotten to meet and work with so many unique and smart people. When offered the chance to become a product manager here at MojoTech, it was an opportunity to take everything I’ve learned about projects, products, and people (myself included) and combine them into one role in an effort to bring these perspectives to colleagues and clients alike. It is an extremely exciting opportunity! Back in my coding days, I worked for a company in Rhode Island that specializes in property insurance. I was able to work with an awesome business analyst there to create a brand new calendar for the company’s research campus so that visitors to the campus could see a colorful but stripped-down version of the same calendar that the campus administrators were putting full on details into, including the names of the clients. The coolest part was going onsite to work through a discovery session and getting to stick around afterward for a campus tour — we saw research scientists and engineers lighting things on fire and blowing things up! It was a fun project, and the most memorable onsite I’ve ever attended. 3. What do you enjoy most about Product Management? And, what do you enjoy least? I most enjoy getting the chance to work with others to bring a vision to life; seeing something move from an idea and a few whiteboard sketches to a tangible interaction that adds real value to people’s daily lives is thrilling. Something that comes along with that, though, is knowing when certain functions or features may not be feasible in the constraints of the project or truly as valuable as one would hope — that can feel like a bit of a let down at times, but it is all in earnest to produce the best possible product at the end of the day. 4. What personal characteristics do you feel are necessary to be a successful PM? I think that a willingness to keep an open mind about everything is very important. As humans, we tend to approach everything we do with a set of biases and opinions about things, but when you are working on a new project, you need to be able to shelve those so that you can keep your mind open to new possibilities and opportunities. 5. What do you get out of product management that you couldn’t get from any other type of work? I think product management is such a unique mixed bag of goodies — it allows someone to move from having a technical conversation to doodling far-out ideas on a whiteboard, to doing research when applicable, and so on. I can’t imagine getting to cram all of that coolness into any other role. 6. Now that you’re at MojoTech, what excites you most? Getting to work on interesting projects with my new colleagues! 7. To which professionals and/or resources do you turn for inspiration? I enjoy reading articles from Inc.com and Fast Company every day to keep my mind in tune with what is happening in the world of business. I also enjoy checking up on agile blogs, like Leading Agile and Mountain Goat Software, to see what challenges and opportunities others are coming across in their day-to-day. What a strange island — are the outlets running on solar power? I would definitely need an e-reader with as many books as it can hold. 9. What technology is going to take over the world next? I feel like the default answer to this is always artificial intelligence, but I think we’ll create more useful robots to help us with everyday life before we get to artificial intelligence — exoskeletons that assist people with mobility issues and robots that carry your luggage/groceries are two I’ve seen in the news. Pumpkin Spice Lattes in the fall! I prefer knowing things to not knowing things, but I’m not a fan of the idea of the Red Pill since some folks on Reddit have co-opted it for their own not-so-nice purposes.